Linda Pastan's is a domestic voice, finding art in the quotidian, and in its disruptions, both painful and glad. As if in preparation for this kind of literary life, she was born into a Jewish family in the Bronx in 1932, went on to Radcliffe College for her undergraduate degree, then earned an MA at Brandeis University. Among her many books are Traveling Light (W.W. Norton & Co., 2011); Queen of a Rainy Country (2006); The Last Uncle (2002); Carnival Evening: New and Selected Poems 1968-1998 (1998), which was nominated for the National Book Award; An Early Afterlife (l995); Heroes In Disguise (1991); The Imperfect Paradise (1988), a nominee for the Los Angeles Times Book Prize; PM/AM: New and Selected Poems (l982), which was nominated for the National Book Award; The Five Stages of Grief (l978); and A Perfect Circle of Sun (l971). Her awards include a Pushcart Prize, a Dylan Thomas Award, the Di Castagnola Award, the Bess Hokin Prize, the Maurice English Award, the Charity Randall Citation, and the 2003 Ruth Lilly Poetry Prize. 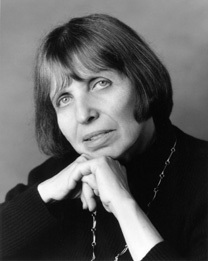 A recipient of a Radcliffe College Distinguished Alumnae Award, she served as the Poet Laureate of Maryland from 1991 to 1995. When I chose poems for Carnival Evening, my New and Selected, I felt as if I were deciding which poems would live, which would die. And the choices I made were often arbitrary, reflecting merely what I felt at the moment. This, then, is my opportunity to resurrect some of those poems that were left behind—poems that I still care about. water and water, sky and sky. when you moved imperceptibly from my embrace. like the almost extinct heron. the moon will salt to grey. a child’s drawing of flight. under the surfaces of sleep. Topeka . . . Junction City . . .
steals down the porch stairs. you balanced it better alone. "I love white things. Oh, I love white." And you said: that's it. that light is wasting away. let us fill ourselves up.